EADA joined the Chinese New Year celebrations – the year of the monkey –the Chinese community’s most important traditional festivity. 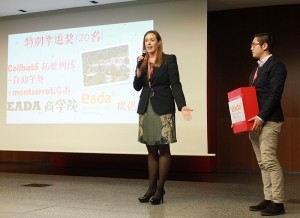 EADA sponsored the event organised annually this time of year by the Chinese Students and Researchers Association of Barcelona to celebrate the New Year. This not-for-profit organisation connects Chinese and local students and researchers in Catalonia, defends the rights and interests of Chinese students there and builds bridges between Spain and China. The Chinese students who form part of the organisation are studying degree courses in various Catalan universities. The event was celebrated on February 27 in the main building of the Universitat Pompeu Fabra (UPF) and was also backed by Universitat Politècnica de Catalunya (UPC). It featured a series of musical performances by the students themselves as well as speeches by spokespersons from the collaborating universities. Giorgia Miotto, the Director of Communication and External Relations, who spoke on behalf of EADA, pointed out the growing interest that EADA’s training programmes awaken among young Chinese students looking to supplement their undergraduate degree courses. Furthermore, Ms Miotto stressed the need to “continue promoting the multicultural nature of our classrooms, providing quality higher education opportunities to student profiles from all countries around the world”. The Head of Admissions and International Programmes, Bibiana Camba, offered the students the opportunity to take advantage of EADA’s scholarships to access any of the school’s training programmes. In addition, she announced 20 places available to Chinese students to attend the “EADA Experience Day” in March, a session specially designed to familiarise attendees with EADA’s methodology and Residential Training Centre. “We want to cater to the demand of the Chinese talent that has chosen our city for their post-graduate education to continue growing personally and professionally,” said Ms Camba. 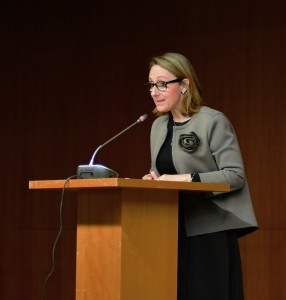 “The Chinese New Year celebrations give us the opportunity to forge ties with the Asian community in Barcelona.” She added that EADA’s relationship with the Chinese community in Barcelona and abroad is not new, pointing out the school’s long-standing joint ventures with Chinese universities and inter-institutional relationship with China Club, representing Chinese managers and executives in Spain.